There are 5 Memory Care Facilities in the Altoona area, with 1 in Altoona and 4 nearby. The average cost of memory care in Altoona is $6,750 per month. This is higher than the national median of $4,650. Cheaper nearby regions include Eustis with an average starting cost of $2,750. To help you with your search, browse the 1 review below for memory care facilities in Altoona. Better rated regions include Eustis with an average rating of 5.0 out of 5 stars. Caring.com has helped thousands of families find high-quality senior care. To speak with one of our Family Advisors about memory care options and costs in Altoona, call (855) 863-8283. In the 2010 Census, Altoona was home to 89 people, and almost 24 percent were aged 65 and over. As nearly 12 percent of Florida's senior population has been diagnosed with Alzheimer's disease, memory care facilities are important in communities of all sizes. Altoona has one memory care facility catering to people with dementia, and a further four can be found in nearby Eustis and Tavares. The Agency for Health Care Administration. 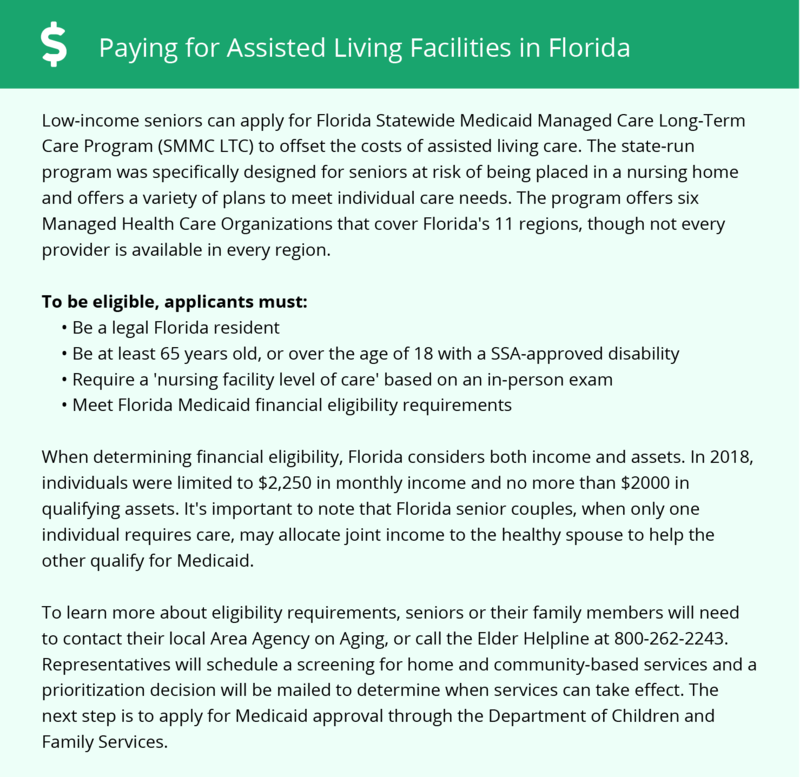 monitors and licenses assisted living facilities in Florida. Facilities that offer specialized care to people with Alzheimer's disease and other forms of dementia must have higher staff numbers and provide specialized training to staff. Florida has no state income taxes, which means that in Altoona there are no taxes to be paid on any forms of retirement income. In addition, sales taxes in the state are close to the national average. This allows seniors and their families to put more money aside for memory care. The Altoona area has no facilities from which to choose in the event of a medical emergency or illness, with the nearest major hospital located in Tavares. Facilities specializing in brain health and dementia can be found in Orlando. Sperling rates Altoona's cost of living at 98, two points below the U.S. average of 100. Healthcare costs are rated at 96, two points below Florida's average of 98. This may mean savings for seniors with health conditions, leaving more money in the budget for memory care. Altoona is warm year-round, with January lows averaging 45 degrees and July highs around 92. Although the town gets no snow, there is an average of 53 inches of rain each year, 14 inches more than the national average. The town's warm weather may mean that memory care residents have the opportunity to spend supervised time enjoying the sunshine. Memory Care costs in Altoona start around $6,750 per month on average, while the nationwide average cost of memory care is $4,798 per month. It’s important to note that memory care rates in Altoona and the surrounding suburbs can vary widely based on factors such as location, the level of care needed, apartment size and the types of amenities offered at each community. To see a list of free memory care resources in Altoona, please visit our Assisted Living in Florida page. Altoona-area assisted living communities must adhere to the comprehensive set of state laws and regulations that all assisted living communities in Florida are required to follow. Visit our Memory Care in Florida page for more information about these laws.